With the goal of producing more fish for endangered orcas, the Washington Department of Fish and Wildlife raised 7 million additional hatchery salmon in 2018 to release this year in the Columbia River, Puget Sound and tributaries to Washington's coast. 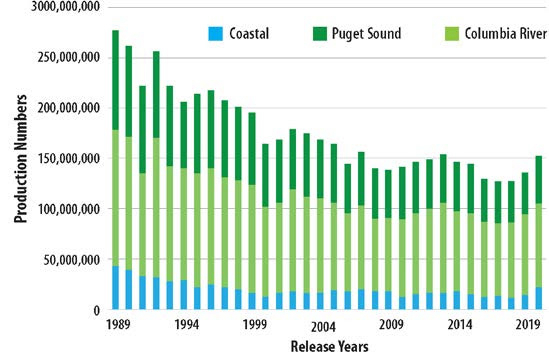 And if state lawmakers agree, this boost in hatchery production is just the beginning. In a Jan. 7 proposal to the state Legislature, the agency is asking for $6.4 million in the 2019-2021 budget to raise and release nearly 24.2 million additional Chinook, coho and chum at 21 state hatcheries from now through 2021. After decades of decreasing hatchery production prompted by hatchery reforms and a lack of funding, the plight of southern resident killer whales is reversing that trend. According to the report, total production at state hatcheries dropped from about 275 million salmon and steelhead in 1989 to about 145 million in 2017. Fish and Wildlife's plan would increase those numbers to more than 150 million juveniles in 2020. And a new policy adopted by the Washington Fish and Wildlife Commission in September seeks to boost Chinook production by 50 million additional smolts. The added 7 million juvenile Chinook and coho now being raised at 17 state hatcheries includes 900,000 more spring Chinook at the Lewis River Hatchery for release in the Columbia Basin. If the Legislature appropriates more funding for the 2019-2020 biennium, hatcheries at Beaver Creek, Lyons Ferry, Kalama and Ringold will join Lewis River to raise a total of 2.1 million Chinook and 675,000 coho to add to Columbia River system.